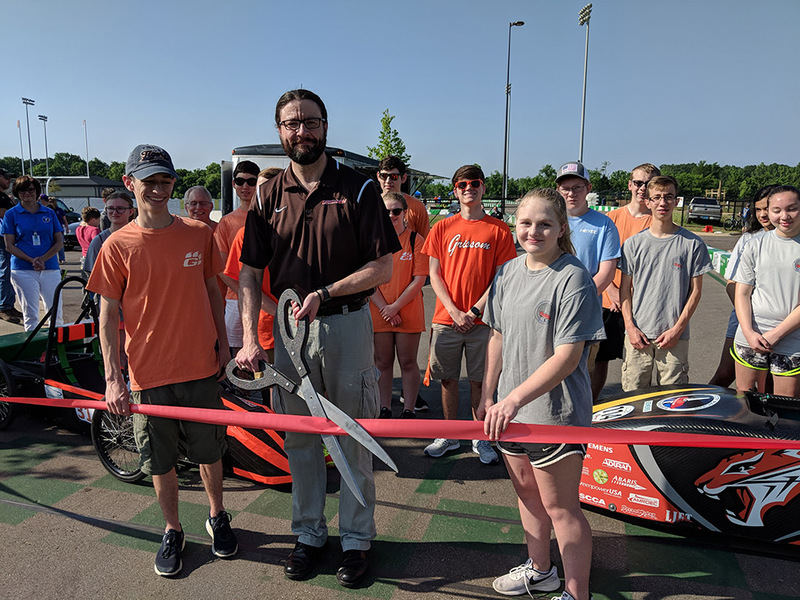 For the final Greenpower race of the 2017-2018 school year, HCS welcomed 44 teams (450 students) from across the country to compete for the first time on the Grissom race track. Teams traveled from Pennsylvania, Florida, Tennessee, Georgia and all across Alabama to claim the top spot in the Grissom Grand Prix. Throughout the weekend, teams gave oral presentations, completed a test driving session and performed a 90-minute endurance race. The new Grissom Greenpower track is 1.1 miles long and gives teams an opportunity to maximize speed compared to the other Greenpower tracks at Jemison and Whitesburg. The F24 Intermediate class showcased 28 middle school teams, which competed in two 14-team racing sessions. The F24 Advanced category was comprised of 17 teams, which competed in two separate racing sessions. The high school teams race placement was determined by the best distance between the two heats.